The Spider Miner drone is the most common mining drone in use today. It is manufactured by the Caldari industry giant Ishukone and is readily available throughout the world of EVE. It is not the best mining drone out there, but it is cheap and reliable, which explains it's success. The Spider Miner uses cheap laser technology to accomplish its task. The laser beam fulfills three essential tasks: extraction, transport and classfication of minerals. First of all it vaporizes the minerals on the surface of the asteroids where they form a charged plasma gas. Secondly, the laser beam itself is shaped as a cylindrical beam. By pulsating the laser amplitude, a rotating magnetic field is induced on the cylindrical surface. This acts as a 'screw' shaped magnet on the plasma particles, that get sucked up inside the cylindrical laser tube. Due to the different mass/charge ration of the atoms, the particle beam is diffused, like a ray of light through a prism. This enables the drone to sort and accumulate the different minerals. Obviously, a lot of the vaporized minerals actually fall outside the beam and are thus wasted, but the benefits and ease of use of the drone outweights this waste for most practical purposes. 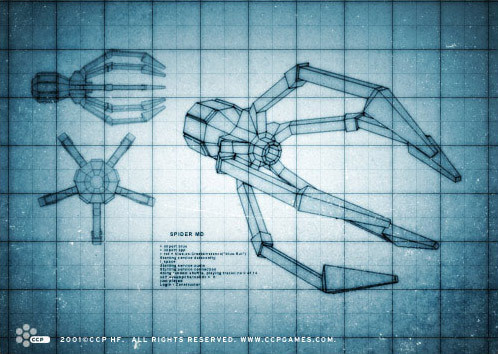 The spider miner is agile and has a good range, allowing the controller to travel up to a few kilometers (depending on the density of the asteroid field) and still recall it. Experienced miners frequently use two or more mining drone teams at once, allowing them to leapfrog from one asteroid to the next, constantly scanning for suitable asteroids to mine while his teams are busy carving up another one somewhere else.